With hundreds of miles of pristine coral reefs, a kaleidoscope of tropical marine life, incredible visibility like you’ve never seen before and warm waters just begging you to jump in, it’s no wonder the Bahamas is one of the best places in the world for snorkeling. Whether you prefer to explore mysterious shipwrecks full of secret hidden rooms or keep it simple and admire schools of brightly colored fish without venturing too far from the surface, the Bahamas has got the perfect snorkeling spot for you. 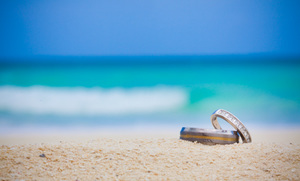 Although they often get lumped in together, diving and snorkeling are two completely different things. And the last thing you want to do is get yourself all pepped up for a day of awesome snorkeling only to find out that the place you’ve showed up at is only suitable for scuba divers and way too deep for snorkelers. 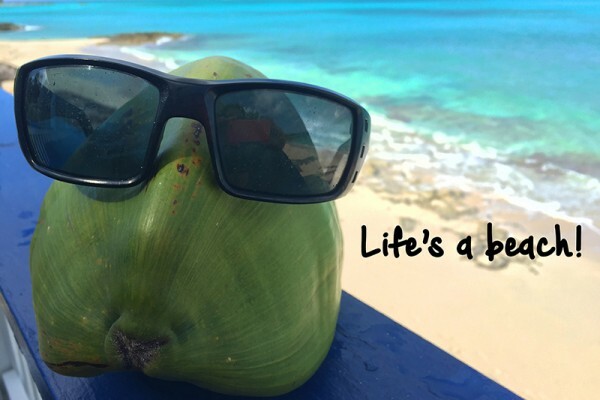 To help you easily replace what could be a sad day full of disappointment and regret with happy day full of incredible experiences you’ll be telling everyone about for years to come, we’ve put together a list of the very best places for snorkeling in the Bahamas. 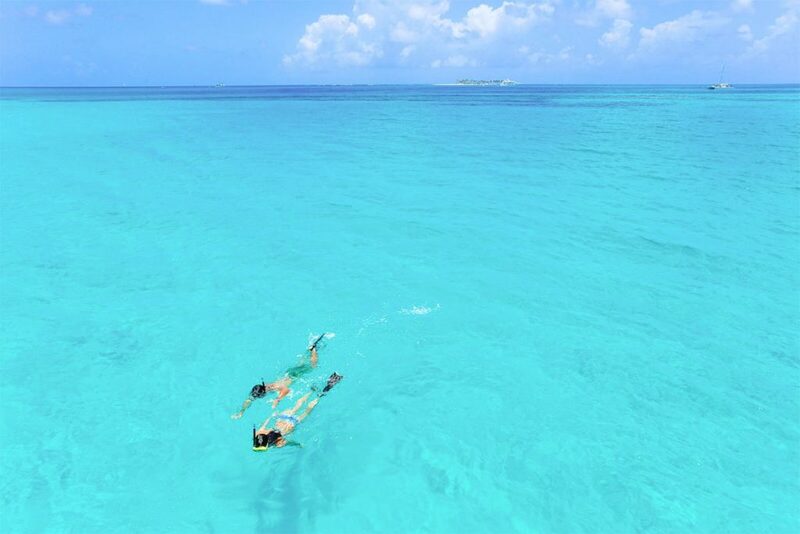 One of the best spots for Bahamas snorkeling is right on our doorstep at Rose Island Reef! Located just a short boat trip west from Rose Island or east from Nassau, this fantastic reef is shallower than most others in the Bahamas, making it great for beginners and anyone who doesn’t like diving down too deep to get a good look around. Although the coral reef itself is beautiful beyond belief, that’s not all you’ll see at Rose Island Reef. This snorkeling hotspot is also home to two fascinating shipwrecks just waiting for you to explore them. The first is the Mahoney: a 212ft long steel-hulled freighter ship built in the 18th century that was sunk 20ft below sea level in 1929. The second wreck is the Alcora: a 130ft long ship that was previously used for drugs smuggling and consequently sunk by the government in 1983 80ft below sea level. As well as providing snorkelers with plenty of nooks and crannies to explore, these two wrecks also create homes for a dazzling array of colorful reef fish, many of which swim around together in complete schools. Even when it’s cloudy or raining, the visibility at Rose Island Reef is so superb that you can always get the most out of your diving experience, regardless of the weather. Tucked in between Compass Cay and Norman’s Cay, Exuma Cays Land and Sea Park can only be accessed by boat or seaplane, but the extra transport hassle is definitely worth it. This park was established in 1958 as the first of its kind with the aim of preserving and maintaining the delicate ecological balance of marine life. Today the park continues to do a great job which is clearly evident as soon as you don your snorkel mask and duck your head under the water. The beautiful Exuma Cays Land and Sea Park stretches on for over 22 miles and is bursting with rare corals, limestone reefs and dazzling tropical fish, as well as blue holes, freshwater springs, underwater cliff drop-offs and hidden caves for you to discover. The well-kept corals are teeming with the remarkably rare blue and green reef-forming algae known as stromatolites. These ancient lifeforms are the oldest evidence of life on Earth and some of them found within Exuma Cays Land and Sea Park are believed to be more than 2,000 years old. Now that’s definitely worth a picture! The most famous attraction within the park is the Thunderball Grotto marine cave where the Never Say Never Again and Thunderball James Bond movies where shot. This must-see spot is open to divers all the time but as a snorkeler, you’ll have to wait for low tide before slipping in. The low rocky ceiling can make it feel a bit claustrophobic, but it’s not often you get to say you’ve snorkeled through a movie set, so go for it. With a complex coral reef system that goes as deep as 80ft, the Gambier Deep Reef is another underwater paradise that’s well-known amongst divers. 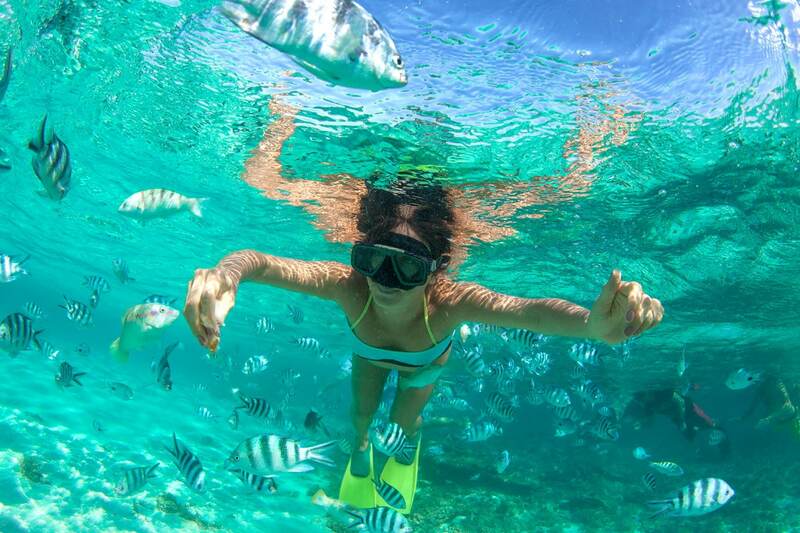 But select parts of it closer to the water’s surface are also home to superb opportunities for snorkeling in Bahamas. Found around nine miles from downtown Nassau, just a short distance away from Cable Beach, the upper coral formations of the Gambier Deep Reef see a healthy abundance of marine life that prefer the warmer waters you get close to the surface of the sea. We couldn’t write about the best snorkeling in Bahamas without mentioning the iconic travel website Frommer’s top pick: Goulding Cay Reef. Set just 30 minutes from downtown Nassau, this shallow coral reef is made up of mostly elkhorn coral which attracts and protects thousands of brightly colored tropical fish in every size and shape you can possibly imagine. Thanks to the shallowness of this reef, it’s easy for anyone with a mask and snorkel to admire the underwater world without having to venture too deep. This makes it the perfect snorkeling location for the whole family to enjoy safely together. The best time to visit Goulding Cay Reef is during low tide, when the top section of the reef is a mere nine feet from the surface. The reef stretches around 30ft down to the seabed which is totally manageable for confident snorkelers who want to see more than you’ll find at the surface. The second largest reef complex found in the western North Atlantic, the Andros Barrier Reef covers a staggering 124 miles, making it the third largest living organism on the planet. This huge expanse of space is divided into dive major sections: the shallow lagoon (home to various mangrove zones), the back reef, the inner fore reef, the outer fore reef and the reef crest. Because it’s one of the most remote reefs in the Bahamas, snorkeling here is incredible, with a plethora of perfect coral reefs and a rainbow of marine life calling this part of the world home. Snorkel here and you’ll have the chance to see more than 160 different species of fish and coral, including huge schools of vibrant red snappers and unusual water sponges. The Andros Barrier Reef starts off relatively flat and gradually slopes down to a vertical cliff. This cliff begins at a mild 60ft and drops off to over 6,000ft in what has become known as “The Tongue of the Ocean”. This exclusive spot is the only place in the world where you can admire the Nassau Grouper Aggregation, earning itself a top spot on any serious snorkeler’s bucket list. Grab your camera and get ready to snap photos of jacks, snappers, tuna, sailfish, tarpons and marlins, too. Even though Bimini is one of the smallest Bahamian islands (it’s only seven miles long and 700ft wide) it’s surrounded by the warm currents of the Gulfstream and because of this boasts a multitude of diverse coral reefs and awesome marine life. But that’s not the only reason Bimini is one of the best places for snorkeling in Bahamas: it’s also home to one of the strangest and most mysterious snorkeling spots in the area, believed to provide proof of the existence of Atlantis. The snorkeling area with the mythical connection is Atlantis Road: a network of unusual rectangular-shaped stones that run in parallel lines so perfectly straight many believe they formed part of the long lost city. If that wasn’t strange enough, Atlantis Road is also located right in the center of the Bermuda Triangle, making it even more intriguing and exciting. But not all of Bimini’s snorkeling sites are about ancient lost cities. 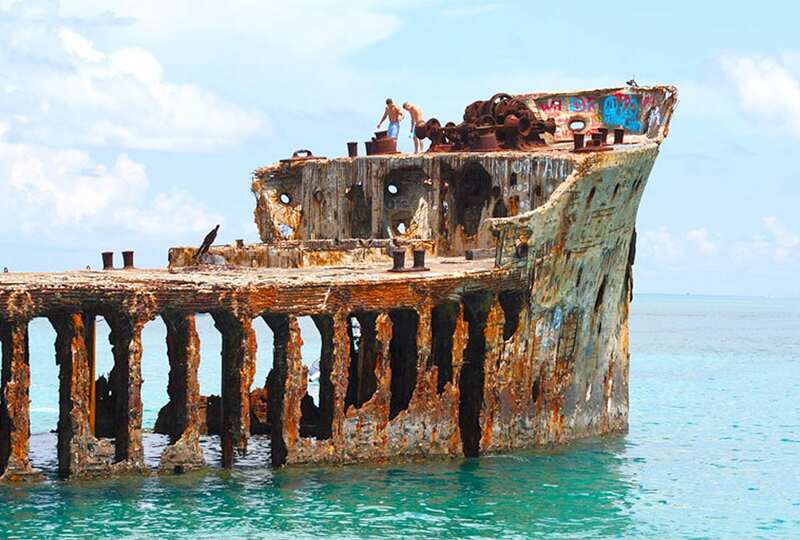 The Sapona Wreck in the southern part of the islands is another fascinating place to visit. This popular snorkeling hotspot is best known for its half-submerged wreck where giant schools of reef fish live amongst friendly nurse sharks and turtles. Even at their deepest, the waters here are only 12ft, making it easily accessible by most snorkelers. Well sheltered by the Sea of Abaco, Elbow Cay is a catch-all when it comes to the best snorkeling in Bahamas, with a huge choice of quality snorkeling sites offering everything from sunken wrecks and rugged coral reefs to glittering schools of tropical fish and much larger marine life for adventurous snorkelers to meet. What’s more, the reliably calm waters and superb visibility make Elbow Cay a great backup location in case bad weather spoils your first snorkeling pick. 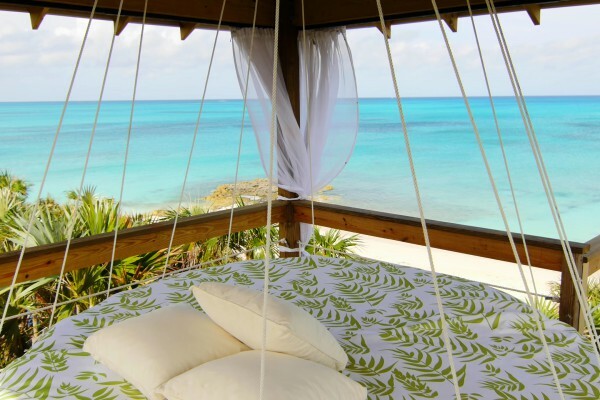 Sandy Cay is popular amongst scuba divers and snorkelers alike, with depths ranging from a shallow five feet to a slightly more demanding 30ft. This part of the Bahamas is known for being home to the largest group of elkhorn coral in a single area, making it an excellent place to see loggerhead turtles, eagle rays, damsel fish, angel fish and butterfly fish. The Maxi Caves are also definitely worth a visit for anyone who wants to see more exotic coral formations and marine life. The depths here range 10ft-35ft and provide snorkelers with amazing views of sea fans, sea whips, brain coral, coral pillars and southern sting rays. That concludes our 2016 list of the best places for snorkeling in The Bahamas.